With fraud and data security threats coming in so many different forms and from so many different channels, ICC Bangladesh President Mahbubur Rahman has said that strong understanding of criminal operations and risk management is crucial for the financial institutions (FIs). "With knowledge along with a strategic plan, there is a better chance of mitigating risks and recognising attacks before they do serious damages to institutions," he told the closing ceremony of a workshop in the capital on Tuesday. 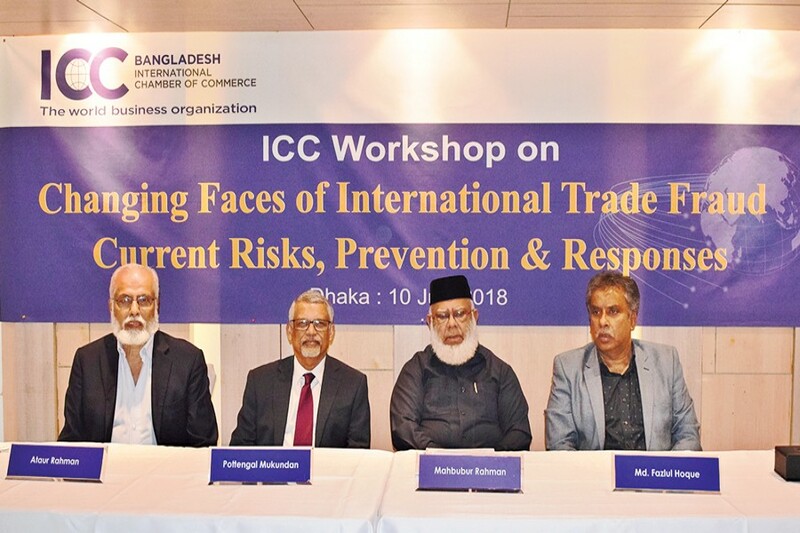 The Bangladesh National Committee of International Chamber of Commerce (ICC), the world business organization, organised the workshop on 'Changing Faces of International Trade Fraud: Current Risks, Prevention & Responses'. In some cases, he said, this might mean investing in new technologies; in others, bridging organisational silos and training staff. "In all cases, it requires taking steps that help improve your institution's ability to detect threats before they reach your customer." GDP-wise Bangladesh is the 33rd largest economy and the 2nd largest garments producer of the world. Certainly the country has made its name as Emerging Tiger in South East Asia contributing to developing all related service industries which include shipping, freight forwarding, customs clearance, commercial banking and legal service, according to a statement. It said smooth commercial transaction and international trade requires strong legal support by conducting due diligence on VAT, tax, customs related matters, determining terms and conditions of sales contract or pro-forma invoices, seeking compliance with local and international foreign exchange control regulation, international trade law, applicable INCOTERMS, UCP 600 etc. ICCB Executive Board Member Md. Fazlul Hoque and ICCB Secretary General Ataur Rahman also spoke at the workshop, conducted by Director and Chief of ICC- Commercial Crime Services P. Mukundan. A total of 193 participants from 37 commercial banks attended the workshop in Dhaka on Tuesday and 74 participants from 29 commercial banks attended a similar workshop held in Chittagong on Wednesday.